Cockroaches are one of the most common pests found throughout the United States, with summer months the most common time for sighting them. Warm temperatures and humid conditions cause the roach to proliferate, with mass amounts of adults dying off in autumn. Surviving members of some species will hibernate for the winter, while other species remain active. The smallest of the North American roaches, German brown cockroaches (Blatella germanica) average 5/8 of an inch in length and proliferate in human habitations. This roach can be active year-round in apartment buildings and other buildings where the interior of walls and other hiding places remain above 50 degrees during the winter. The German browns live 14 to 28 weeks and, although the life cycle slows down during the winter, the roach continues to reproduce and develop throughout the year. Wood roaches (Parcoblatta pennsylvanica, Eurycotis floridana) are a medium-sized species that lives and breeds outdoors and does not survive long inside a home. The roaches become dormant in the winter when temperatures remain below 50 degrees. Adults may die in some species, and nymphs may enter a state of dormancy, continuing to develop into adult members of the species when temperatures warm in the spring. Temperatures above 50 degrees reawaken adults, who immediately begin breeding to continue the life cycle. 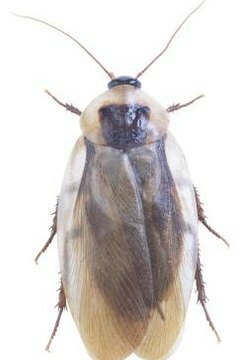 The largest of cockroaches native to the United States, the American cockroach (Periplaneta americana) is sometimes known as the sewer roach or palmetto bug. It prefers to live and breed in damp areas with lots of organic matter and thrives in city sewers. The roach is most active at night during the summer months of June and July when summer rains bring high humidity and the warmest temperatures. As temperatures dip below 50 degrees at night, the roach becomes dormant and sometimes dies. Easily distinguished by a white band on their brown bodies, these small roaches live in office buildings and homes. The roach does not hibernate but remains active throughout the winter as long as it can remain indoors. When suddenly exposed to sub-freezing temperatures, however, the brown-banded cockroach will go dormant and die after about a week. You can interrupt the life cycle of the roach by placing appliances or electronics where roaches have laid eggs in an unheated garage in freezing temperatures for about a week.